Photolysis of “caged compounds” is a powerful biophysical technique with the capability to very rapidly convert inert chemicals into their biologically active form with a flash of light. The resulting concentration jumps allow to probe biological functions with exceptional temporal resolution, and in conjunction with imaging techniques, with excellent spatial precision. 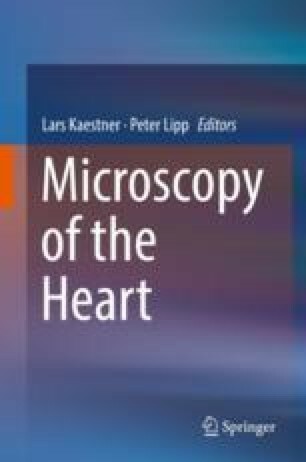 This chapter presents an overview of various applications for photolysis of caged compounds in the exploration of cardiac muscle function. After a synopsis of general features of caged compounds, studies focusing on several areas of cardiac muscle research are briefly described together with examples of caged compounds used in that particular field of research. Finally, more general information is presented regarding the methods and instrumentation available to apply these techniques, but also with reference to possible problems and pitfalls that need to be considered. Finally, an outlook into future developments of this and related technologies is outlined. This work was supported by the Swiss National Science Foundation (31-132689 and 31-156375 to E.N. ), by the National Institutes of Health (NIH; R01AR053933 and R01HL093342 to N.S), by the Swiss Foundation for Research on Muscle diseases and by the Microscopy Imaging Center (MIC) of the University of Bern (to E.N. and N.S. ).